Sat. : 10 am - 2 pm. When the Port St. John Public Library opened in 1988 the population of Port St. John was 8,500. The year 2000 statistics for Port St. John are estimated at around 20,000, an increase of over 230%! The 9,000 square feet of library space in 1988 was sufficient, but an expansion was needed. 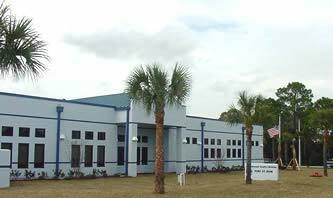 The Brevard County Commissioners approved an expansion from 9,000 square feet to 16,000 square feet which was completed in January 2003. A grant from the State of Florida committed $300,000 to the project, thanks in part to calls from members of the Friends and community support. The present facility is used for voting, literacy tutoring, workshops and meetings in the Port St. John area. The library offers free access to Internet. For over 4,000 students attending the Port St. John schools plus parochial, pre-school, high school, and home-school students, the library is a valuable resource. The library circulated 95,000 books in 1997, and 129,000 in 1999. It is truly a community library. The Friends support the library through its memberships, book sales, and special gifts. Funding from the Friends provides supplies for children's story hours, library programs, special library projects, and helps promote awareness of library events and services. We need you and want you to be a Friend of the Port St. John Public Library! Please consider becoming one so that you can be a part of the exciting times ahead at the Port St. John Public Library. BREVARD COUNTY, Fla. – Due to increasing demand, Brevard County libraries will offer notary services at all public libraries throughout the county beginning April 1. The charge for witnessing signatures on documents is $2 per seal; the service is available to both patrons and visitors. A library card is not required. To use the service, inquire at the library's reference desk. Notary services are expected to generate nearly $100,000 to help fund library budgets. Stop by the Port St. John library to sign up for the Smartest Card in your wallet. Books, books on tape and CD, music CD's, DVD's, VHS tapes are available for checkout. Computers, Internet and WIFI access during library hours. 2 study rooms, conference and meeting room w/kitchen available for reservation. Programs and events are open to the public. Master Gardener: Mondays, 2-4 pm. Senior Games: Tuesdays, 11:00-3:00 pm. Join other seniors for a variety of card games, Rummikub, Dominoes, etc. Bring your favorite game and lunch or a snack. SHINE - Serving Health Insurance Needs of Elders: Tues., Noon-3 pm and Wed., Sept. 5th, 1-4 pm. Counselors assist seniors and the disabled with Medicare and Medicaid questions. Call for an appointment time 321-222-7981. STIR - Story Time for Independent Readers: Thursdays, 3:30-4:30pm. 1st grade and up. Pre-registration required. Story Time: Fridays, 10:30 am. All ages welcome. Yarn Club: Fridays, 2:00-4:00 pm. Knitting, crochet, needle arts. Sit, talk, and create. All ages and abilities welcome. Want to learn? We can help! Mar. 30, 10:00-noon Friends of the Library Very Hungry Caterpillar Spring Event. Snacks, crafts, storytime. * The BookWorms, an adult book discussion group, meets on the second Wednesday of each month. Call the reference desk for more information.